"An insane level of continuous action!" They're back! Years ago while attending Fantastic Fest one year, I was introduced to the brilliance that is A Town Called Panic - a Belgian animated series about the crazy antics of Cowboy and Indian. 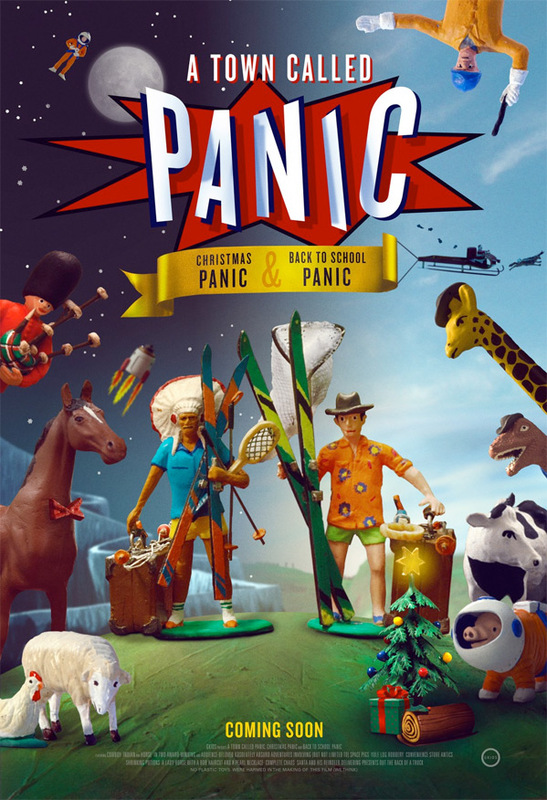 After one full-length film, Cowboy and Indian are back in two new short films, titled Christmas Panic and Back to School Panic. Both of these are packaged together in a 60 minute screening event and will be shown in theaters during the first annual Art House Theater Day coming up later this month (September 24th). If you've never seen this series before, you can start with these and then go back and watch the rest of everything related to A Town Called Panic. Or if you already know all about this series, then jump right in and find out what trouble these two goofballs found themselves in this time. A Town Called Panic: Double Fun is a screening of two ATCP short films during Art House Theater Day. Cowboy and Indian are always up to some harebrained scheme, with Horse left to clean up the mess. In Christmas Panic, their out-of-control antics lead Horse to call Santa and cancel the presents. But the boys figure they can still save Christmas… if they break into their neighbor's house to steal his yule log! In Back to School Panic, a class assignment yields a special prize, but only Pig knows the answer. Cowboy and Indian use a special shrinking potion to sneak into Pig's brain, where they discover a sodium-packed world of pig cops riding in bacon cars and sausage cycles. Both shorts are directed by Stephane Aubier and Vincent Patar. They will be showing in art house theaters all over the country, for free, one day only on September 24th, 2016 this month. For more info, visit the GKids website. Looking forward to these? Haha! This looks cute and frenetic. If you think something looks fun to watch, you probably had fun watching it.